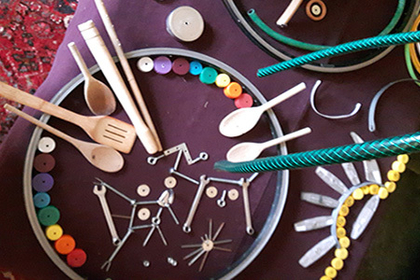 Elements was a practical action research programme of Early Years' creativity, that took place in different settings across Wells and Taunton between October 2016 and April 2017. Using the rich and open-ended theme of elements, six multi-disciplinary artists (Richard Hughes, Lucy Lean, Hannah Lefeuvre, Peter Margerum, Deborah Westmancoat and Howard Vause) were placed in reception and pre-school settings across Taunton and Wells. The artists worked reflectively to allow the children to lead the experience. The project research was conducted by Plymouth University, exploring how creativity can support EY managers to develop creative practice and links to the arts. As part of this project the Artist and setting worked together to carry out a case study based on a research question they have decided upon as part of their planning session. The completed case studies are available to read and download in our Early Years Case Study page. If you would like to read Dr Karen Wickett’s final report on the Elements Project download here.